I put this little kitchen together using some Selecta Ambiente furniture pieces. An hour or so after I finished pushing the the little pieces around, I visited Altera's blog and saw that she had posted a kitchen scene using the same pieces. I laughed out loud. 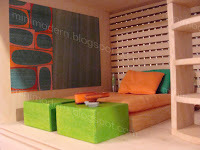 Man, if that isn't a case in point that there needs to be more modern dollhouse furniture out there! It seems that very few are listening to that plea. 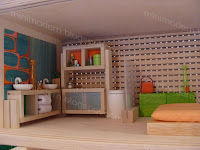 Anyway, I went back to the mini scene and revamped it to be a bathroom. Above are the two versions. 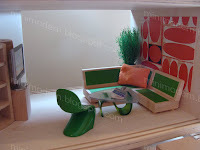 The sinks and toilet are from the Dolls House Emporium's Funky Furniture sets. The green Panton chair is Reac. The sectional couch was a gift. The coffee table is from the Lil' Bratz sets. 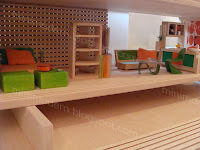 The bed and benches are from Voila Toys. The divider wall is from Ryan's Room. The planter is from Plan Toys. The wall art is Rex Ray. All other accessories are Re-Ment, Megahouse, Breyer, Lil' Bratz, Mattel, Mighty World, AG Minis, Sirch and Voila Toys. So true! Love the bathroom (and kitchen) set up. Also - the green panton chair is da bomb! Hey VWong, It's tough being a supermom. Smiles. 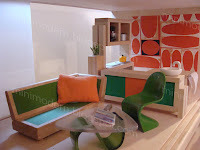 Hi MC, Any clue which Lil Bratz set has the funky coffee table? I've had little luck locating one. thanks! It's Lil Bratz Stylin Space. That name is so dumb. Thanks! Crazy price. So far I can only find it for cheaper at $37 incl. shipping. My daughter was horrified when she saw I bought one of the other Bratz sets for the accessories -- "That's not for ME, right??!"